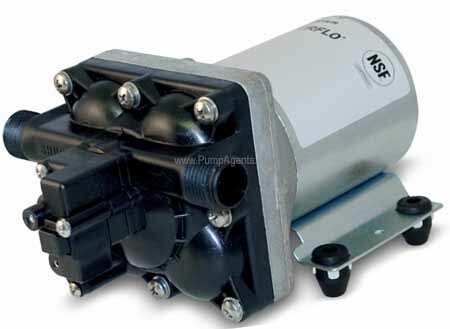 Shurflo catalog # 5030-2201-A010, Diaphragm Pump with 12 Volt DC Motor and Switch and Bypass. Polypropylene Pump Body, EPDM Valves, Santoprene Diaphragm. Inlet Port is 1/2 Inch-14 NPSM, Discharge Port is 1/2 Inch-14 NPSM. Comes with 16AWG Motor Wire: 12 Inch. 12 Volt DC. 16AWG wire: 12 Inch.